Join us for 8 weeks of deep connection and learning where we will walk through the process of rumbling with our story to rise and write our own ending. Rising Strong™ is a book and curriculum about what it takes to get back up. We explore how owning our stories of struggle gives us the power to write a daring new ending. We discover how struggle can be our greatest call to courage and the clearest path to a wholehearted life. This course is highly experiential and based on the research of Dr. Brené Brown. In this group we explore The Reckoning. The Rumble. The Revolution. 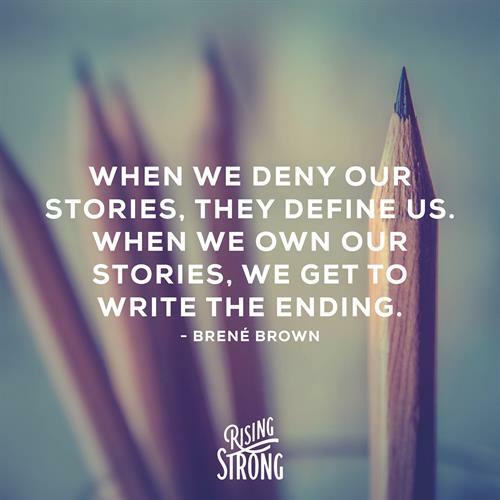 Our intention is to own our stories of struggle and empower ourselves to write new endings to those stories. This is an 8-week closed group course. We will meet on Wednesdays from 6:30 to 8:30 pm starting on April 10, 2019 and ending with a final session on Sunday, June 9, 2019. Email or call Cecile at cecile@cruxcoaching.ca or 250-919-6529. Cost: $375 + GST, which includes a beautiful workbook, all course supplies, snacks, tea, coffee and great conversation and learning. Call or enrol online today to avoid disappointment – only 8 seats are available!